Gambling’s an ancient tradition on the Nevada side of Lake Tahoe. The early Washoe Indians loved a good wager as much as today’s visitors. Gambling has been legal in Nevada on again and off again since the 1930s, so it’s deeply embedded in the culture, and you’ll find lots of places to play games of chance, including the grocery stores. But the grand casino tradition really began in the early ‘40s started by two men, Raymond Smith who founded Harrods and Bill Harrah of Harrah’s Hotel South Lake Tahoe fame, of course. These visionary gamers risked it all for big profits, buying land, developing real estate and designing more challenging and interesting ways to risk your money. Today some of the most exciting headliner entertainment and high roller accommodations and quality restaurants can be found in the Stateline Hotels in Nevada and South Lake Tahoe California Hotels across the stateline. Remember that there is no gaming in California except on Indian Reservations. You can also find action in North Lake Tahoe at the hotels in Crystal Bay and at the Incline Village hotels. There are lots of different size places to go and spend an evening, we are listing the larger venues, where you will sure to have a good time. The games of chance offered in these expansive locales are standard American style favorites such as poker, blackjack, keno, craps, baccarat, roulette electronic versions of all these games, plus one armed bandits. If you’re from outside the country, be sure you understand American rules for gaming. There are slight differences! Here are the biggest hotels in Lake Tahoe that have gambling Vegas style. (currently under rennovation) Once owned by Frank Sinatra and frequented by the rat pack, JFK, Marilyn Monroe and other cold war hotties, it’s worth a visit to just soak up the history. Occasionally they still books a big acts on their stage. The resort is so named because it straddles two different states, so you can swim across state lines in their magnificent outdoor pool All rooms have view of the water, and one bar has a ceiling decorated with crystal making it a dazzling sight at sunset. Fabulous lighting on winter nights, too. 111 Country Club Drive at Lakeshore Blvd. Home of a great annual jazz festival, you can count on catching live bands most nights of the week at the Hyatt, with frequent concerts. The rooms have typically Hyatt class luxury with a deep woodland décor throughout. Tennis courts, spa, heated pool and more. You can even rent beautiful two bedroom cottages on the beach. Formerly Caesars, sorry to say, the togas are gone. Yes, full gaming including sports betting. You can take a gaming cruise on their private yacht just to spice things up a bit, or drop in to dance all night long (the floor never closes). Beautiful views and big name entertainment. Formerly Caesars Tahoe. Bill Harrah practically invented Reno gaming. This second location is elegant with convex windows, two bathrooms in each room, nicely built to fit into the landscape, décor in great rustic tradition so you feel like you’re outdoors all the time. The famous and exquisite Summit restaurant is located in the penthouse where Sammy and Elvis used to stay as guests. Enjoy pool, spa, shops. 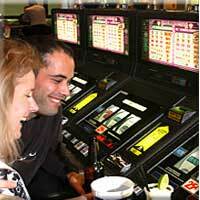 South Lake Tahoe’s original gaming casino has been revamped extensively to keep its modern, contemporary feel fresh. It’s the largest in Tahoe with beautiful views and 52000 square feet of gaming. Burnt on that last hand and need a good laugh? Check out the comedy club.